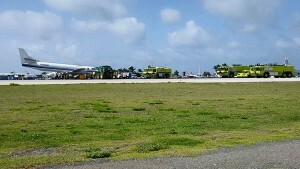 PHILLIPSBURG - A private aircraft crash landed at the Princess Juliana International Airport around 2pm on Friday. The news website SMN News indicated that the landing gear of the aircraft failed. The aircraft is a small cargo plane. Apparently no one was hurt. According to a well-placed source, the front landing gear on the aircraft broke off. The aircraft was on the landing strip at PJIAE which was blocking all inbound and outbound flights. Workers quickly removed the aircraft from the landing strip in order to restore full services.